Garlic Broccoli Steaks roasted on high heat then finished in a pan with just a bit of butter and slices of garlic. 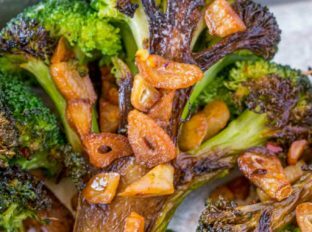 We love Parmesan Roasted Vegetables which include broccoli, these are the main course version of your roasted veggie dreams. 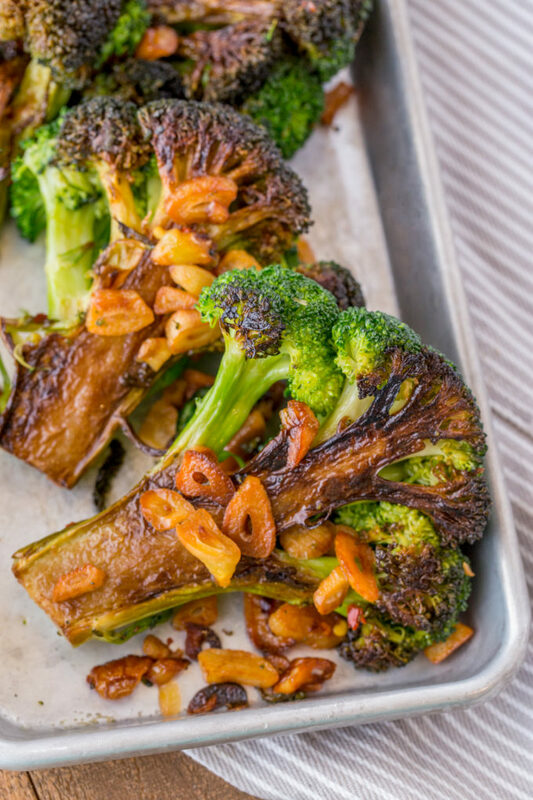 Broccoli Steaks are the fraternal twin to one of my favorite roasted vegetable options for dinner, Crispy Cabbage Steaks. Cabbage steaks take a bit more oil than I wanted to use in this recipe (also we’re using BUTTER! YUM!) so I chose a vegetable that we could roast with just a bit of canola oil spray. The garlic. Oh the delicious garlic. We start with roasting it in the pan with the broccoli but then we finish it in the pan with the butter. 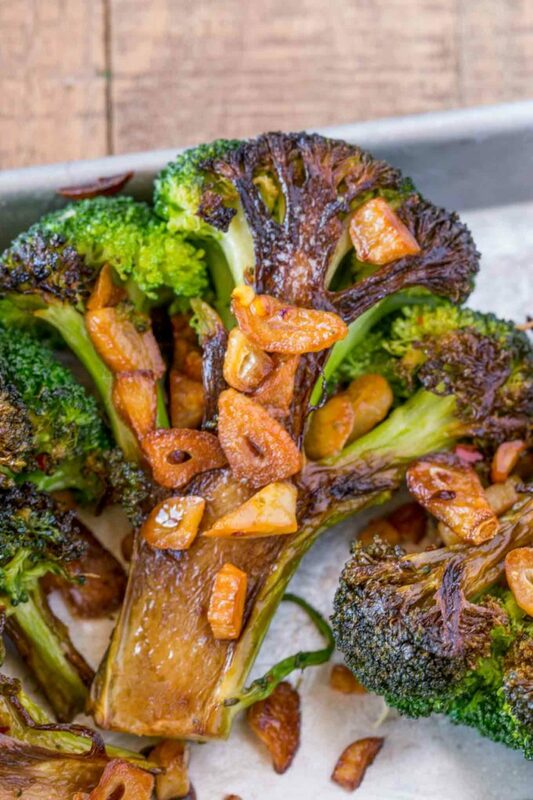 The magic to this recipe is to roast the broccoli heads 99% of the way, then finish them cut side down in a small amount of butter to give them ALL the butter flavor, but without needing a ton of butter in the roasting process. The garlic browns to a delicious golden brown. Careful not to overheat your pan. I call for medium, if you find things burn quickly for you, err on the side of medium-low. The worst thing you can do it let the garlic burn as it will turn bitter. Vegetable steaks exploded in popularity after the cauliflower steak got a lot of press a few years ago. Many people started enjoying cauliflower steaks as a vegetarian alternative to serving a main protein with sides. You can use this method with a number of vegetables and have a great large serving of delicious butter roasted “steaks” while staying on point. 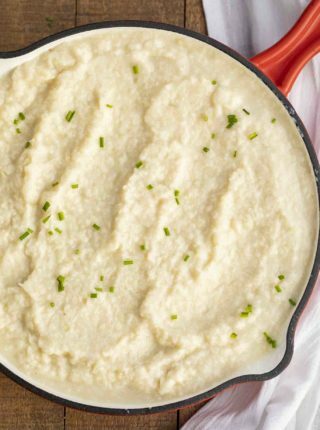 Cauliflower Steak: The king of veggie steaks and the easiest to cook, make it similar to the recipe listed below. Portabello Steak: The classic vegetarians are used to, I like to add a bit of soy and garlic when roasting off portabello steaks. Celery Root Steak: Sliced into 1″ thick sections like you would slice tofu, you can roast them for 15-20 minutes before basting in the garlic and butter. Squash Steak: Hard squashes like acorn, butternut, and pumpkin can make delicious roasted steaks as well, cook them for 30-35 minutes before basting. What to serve with Garlic Broccoli Steaks? 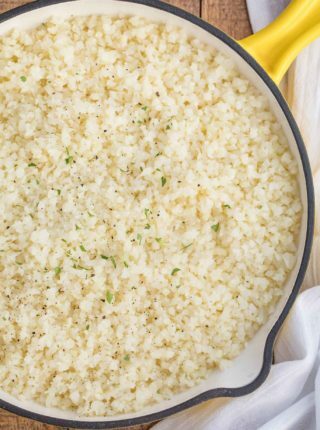 We love to serve this dish with Balsamic Bruschetta Chicken or Skinny Chicken Alfredo Pasta as the perfect garlicky side dish. Cut the broccoli in half to make two steaks. Add the broccoli and garlic to a bowl and spray with canola oil spray (I sprayed for about a second while tossing. Season with salt and add to baking sheet with a silpat. Add the butter to a large skillet (I did this in two batches, so 1 tablespoon for each batch) on medium heat. 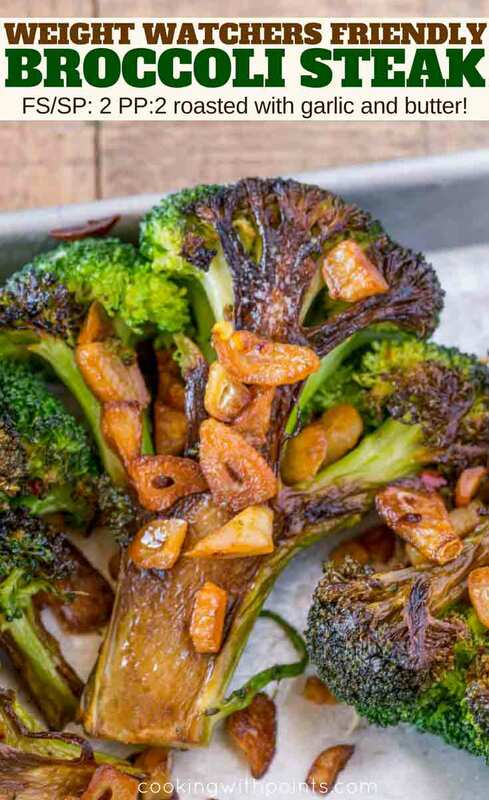 Add the broccoli cut side down with the garlic and cook for 45-60 seconds allowing the broccoli to brown and the garlic to caramelize. Repeat with the second batch of broccoli if needed. 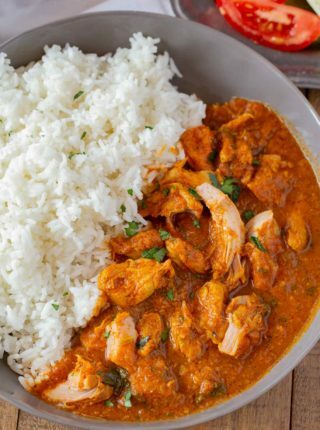 So simple, yet I am seriously craving this! 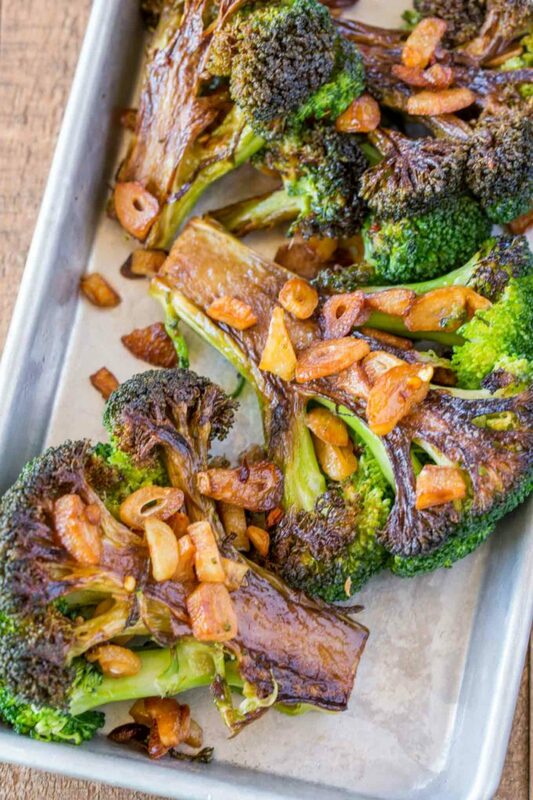 I LOVE roasted broccoli but have never made them into “steaks” I am trying this ASAP. I’ve never had a broccoli steak, but man they sure look delicious!! Looks totally delicious! So thrilled to have this recipe! Thanks, Catalina! Hope you enjoy it! What a fantastic looking side dish! Can’t wait to try it! Such a great way to enjoy broccoli! Must make it! 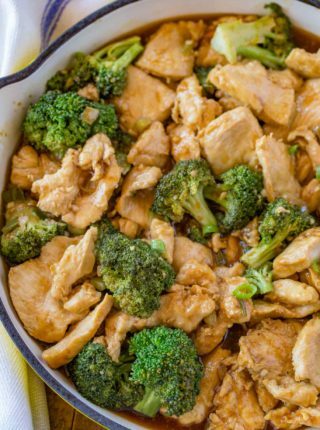 My kids ate an entire bag of broccoli tonight so I definitely need to make this for them sometime! These would be a big hit in my family!